Tim Muddiman and the Strange and Burrowing Bees will kick off the first episode of Northampton Music 365’s Live Sessions series next week. The live sessions are a series of videos featuring live music filmed in front of audiences. They will run as a precursor to next summer’s Northampton Music Festival and tour venues across the town. Tim Muddiman and The Strange recently supported Gary Numan in London. The band is currently working on their debut album, Paradise Runs Deeper, which fans can help fund via Pledge Music. Middiman (picture above) is also one of Numan’s touring guitarists and a member of Pop Will Eat Itself. Burrowing Bees combine trip-hop, electronica, soul and R&B. 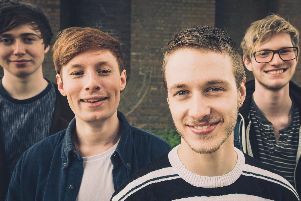 The trio comprise of singer Lauren Green, drummer and guitarist Josh Dudd and synth player Gabriel Halford. The first live session is on Thursday, December 17, at the Albion Brewery in Kingswell Street, Northampton.